February 11, 2015 by Ecommerce News. About Cross-border, Statistics with tags Sweden. 3029 views. The ecommerce industry in Sweden increased by 16 percent in 2014 and is now worth 42.9 billion Swedish kronor, or 4.53 billion euros. 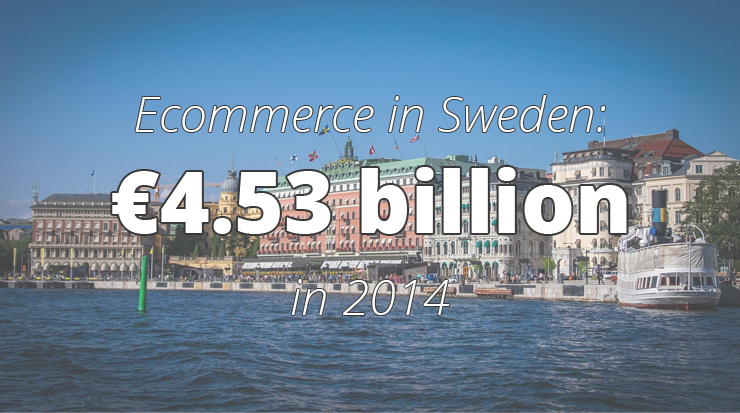 Ecommerce currently accounts for 6.4% of total retail sales in Sweden. 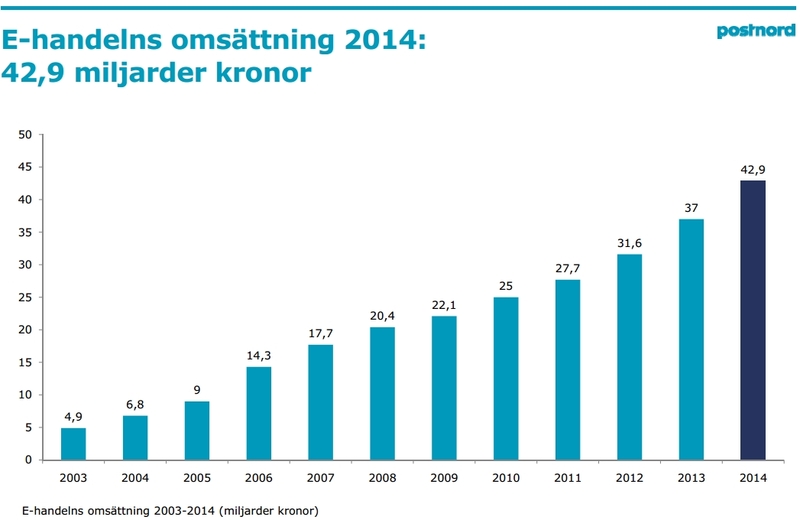 Last year, more and more Swedish consumers used their mobile phones to shop online. PostNord collaborated with Svensk Digital Handel and HUI Research and published the E-barometern 2014. They publish these kinds of studies several times per year and last year’s data showed the Swedish ecommerce industry had increased by 17% to 4.17 billion euros, while the ecommerce accounted for 6% of total retail sales. So in 2014, the year-to-year growth decreased a little bit, while the share of ecommerce in total retail sales grew noticeable. The most popular product categories in the Swedish ecommerce industry are consumer electronics (€1.09bn), clothing & footwear (€792.6mn) and books & media (€359.3mn). But when we look at product categories that increased their sales the most in 2014, we see three other sectors in the top 3: toys (+38%), building materials (+33%) and sports & leisure (+20%). During the first quarter of 2014, these were also the three fastest-growing product categories, which then grew by respectively 31%, 36% and 24%. PostNord also looked more into the Swedish online shoppers. It seems that more than one-thirds (35%) of consumers between 18 and 79 years old purchased goods online at least once per month in 2014. That’s six percentage points more than it was a year ago. Swedish men bought books, clothes, sports and leisure products, computers and computer accessories, while women were more fond of ordering books, clothes, cosmetics and home furniture online. Three in four online consumers feel it is important to choose how to get their goods delivered when shopping on the Internet, while 29 percent thinks it’s important to be able to get a product they ordered on the internet delivered on the next business day. Consumers in the Nordic country also shopped cross-border. They ordered products online from abroad worth 1.21 billion euros. Most popular cross-border countries to shop from, were the United Kingdom, the US, Germany and China. And when Swedes shop abroad, they do it mostly because they want to order clothes and shoes. Online shoppers from Norway, Finland and Denmark on the other hand, are the ones who shop mainly at Swedish ecommerce sites. Two out of three (66%) Swedish companies had sales abroad last year. This is an increase of six percentage points compared to 2013. It’s safe to say Sweden is a very important country for its neighboring countries, while its habitants are looking a lot further abroad to shop at a foreign ecommerce site.